In the last century, school principals were expected to focus primarily on management and administration. Today, schools need instructional leaders who improve the learning and achievement of both students and teachers in their schools. 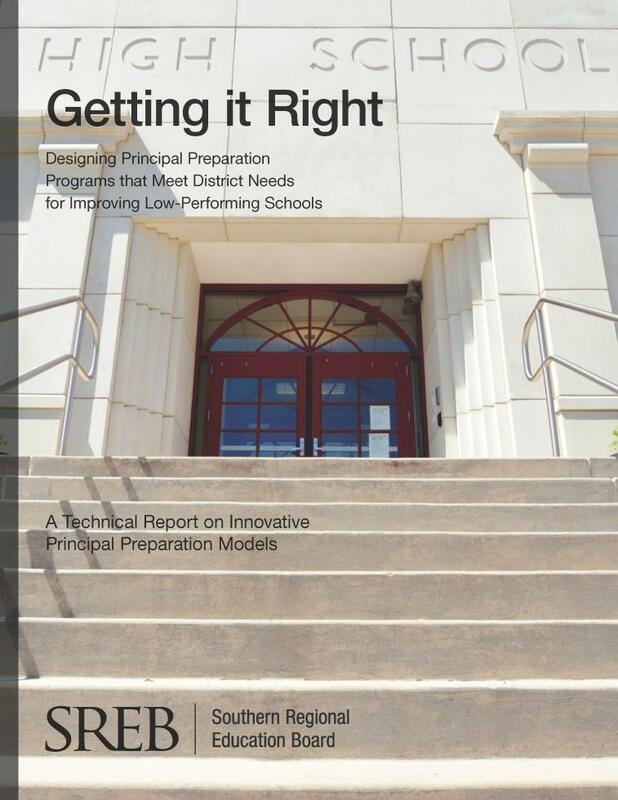 SREB offers school improvement, professional development and technical assistance to serve this objective. The publication takes an in-depth look at the kinds of principals required to turn around the lowest-performing 5 to 10 percent of public high schools in America. Schools stuck at the bottom of the performance chart need first-rate principals with the motivation, vision, skill and commitment to make dramatic improvements in schools and student achievement. 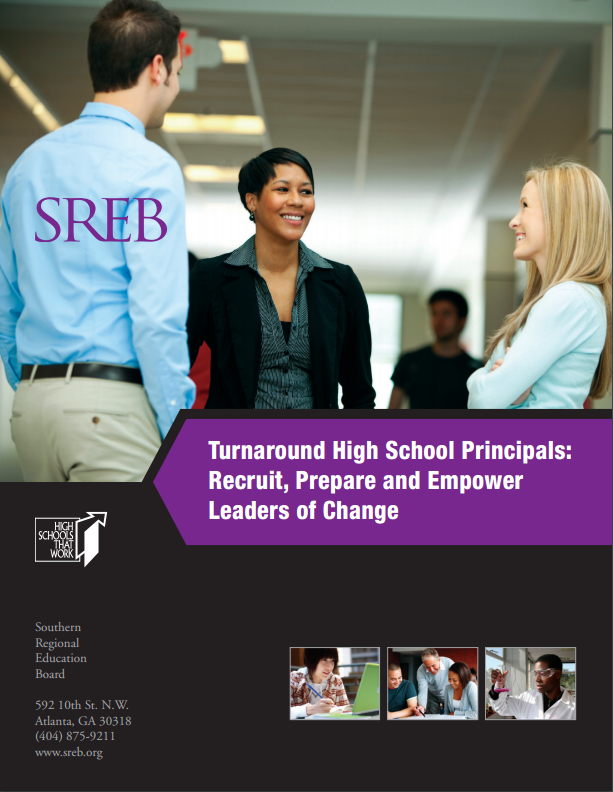 The report describes how we can identify, prepare and support these turnaround principals. 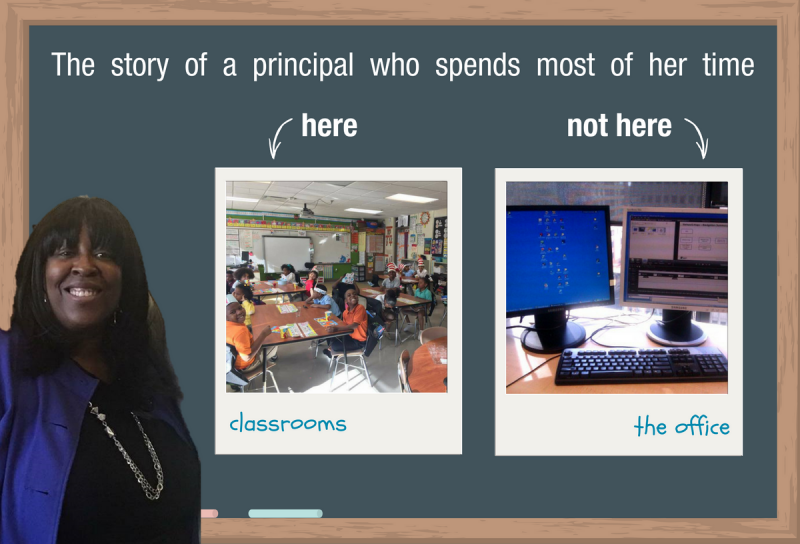 Each year, more than 18,000 principals in our nation’s public schools leave their jobs. Decades of school leadership research make it clear that these vacancies must be filled immediately and must be filled with school leaders who have the strength of character, the knowledge about learning and the leadership savvy to thrive in what is arguably education’s most challenging job. But who is next? 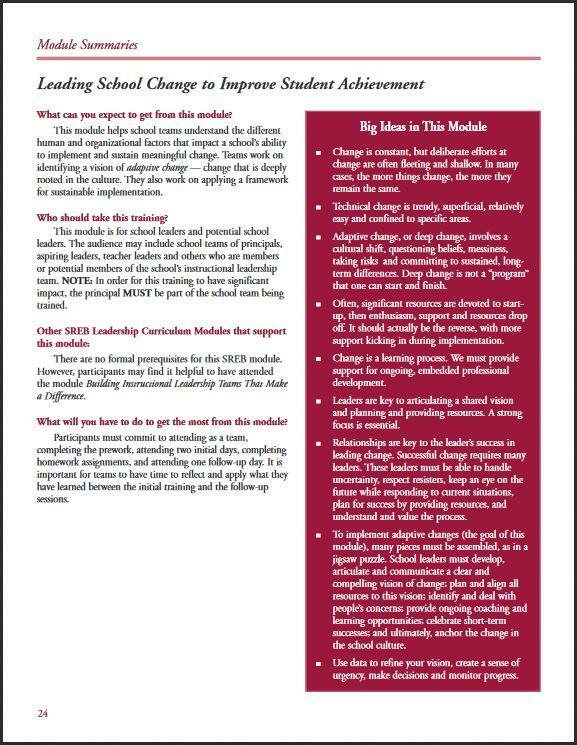 This module helps school teams understand the different human and organizational factors that impact a school’s ability to implement and sustain meaningful change. Teams identify a vision of adaptive change — change that is deeply rooted in the culture — then work on applying a framework for sustainable implementation. 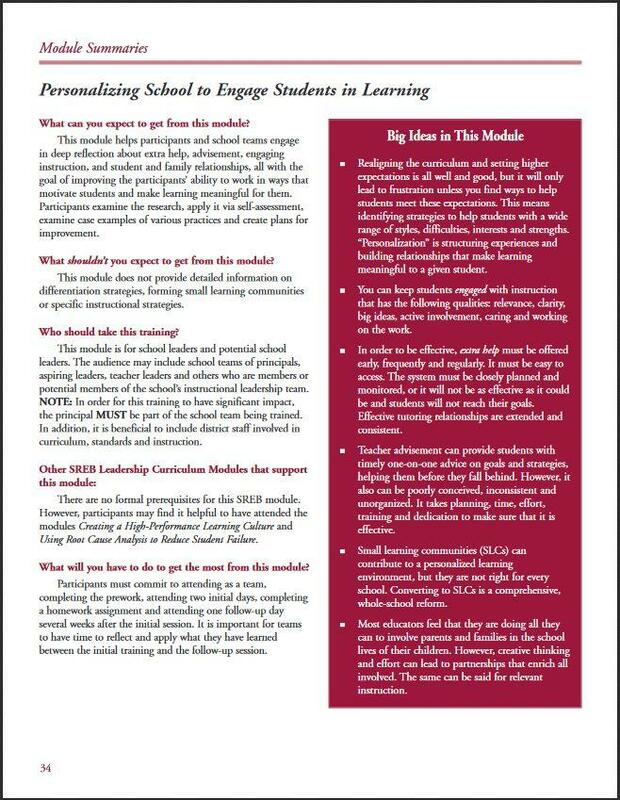 In this report, SREB compares schools in the MMGW initiative that have more fully implemented the MMGW research-based design with others that have been defined as low-implementation schools. The report shows clear differences in the achievement levels and academic success of these two groups of schools. 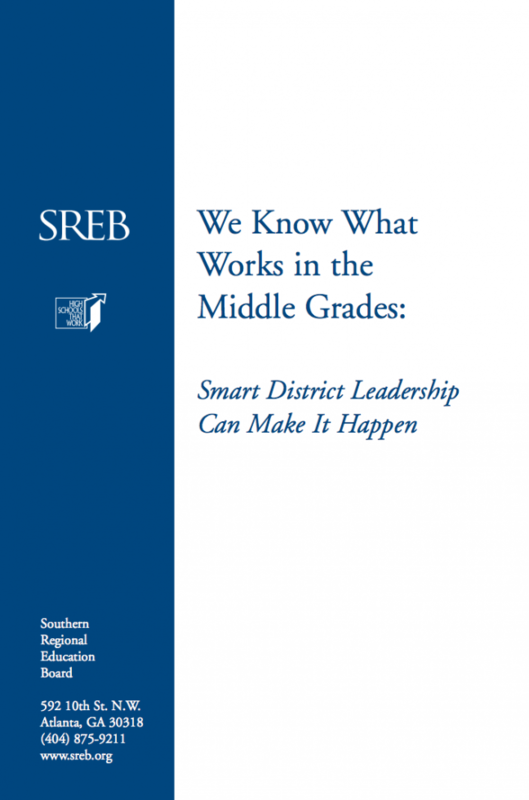 The report also shows that dynamic, sustainable middle grades reform is far more likely to occur when district leaders, principal leaders and teacher leaders are all committed to the same improvement goals and means of achieving them. 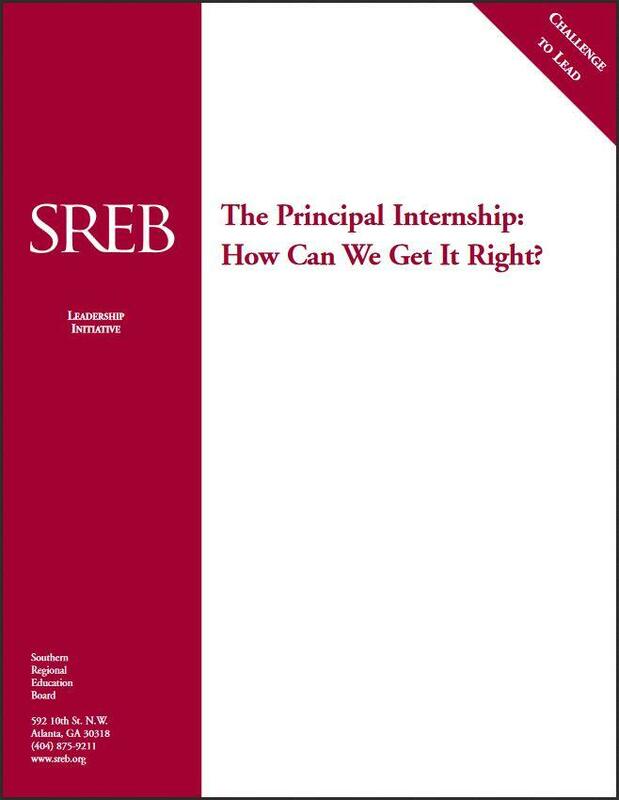 This report presents the results of SREB’s survey to measure the quality of internships provided to aspiring principals in university leadership programs in the Southern states. 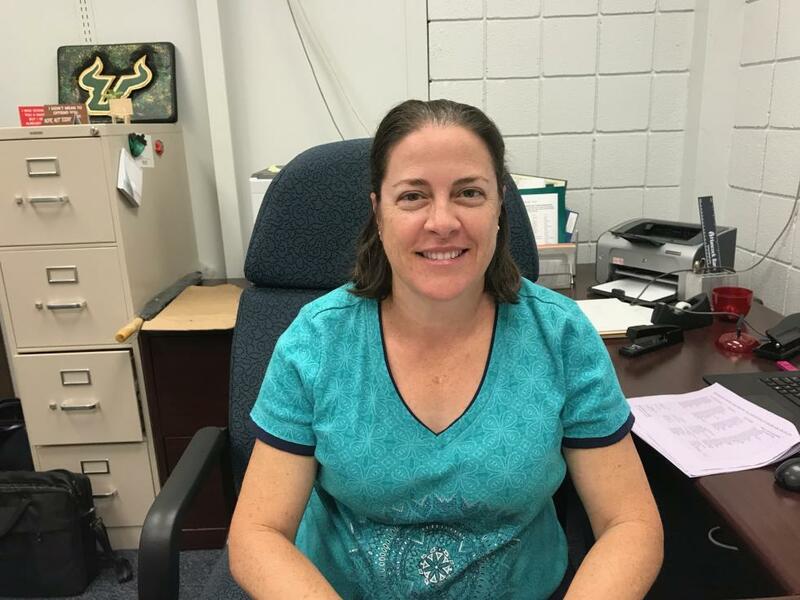 The survey probed the extent to which principal interns are required to observe, participate in and lead activities that focus on improving curriculum, instruction and student achievement. 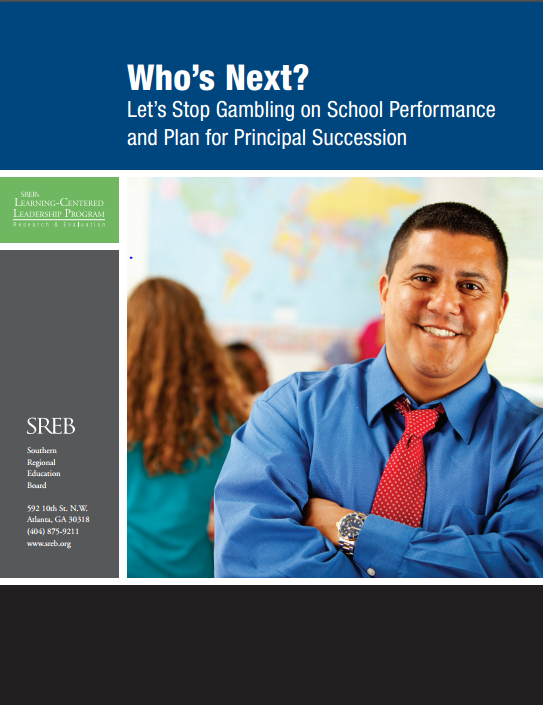 This report describes the findings of SREB’s study of the role of the district office in creating the working conditions that principals need to improve teacher effectiveness and student performance. 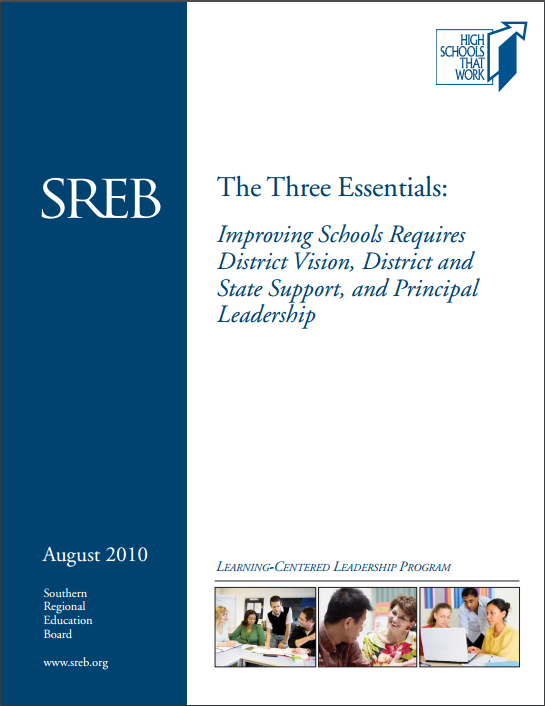 The Three Essentials of school improvement described in the report emerged from close observations of the inner workings of seven school districts, as SREB’s Learning-Centered Leadership Program sought to answer this essential question: What are the conditions school districts can create that make it possible for principals to be more effective in leading school improvement? 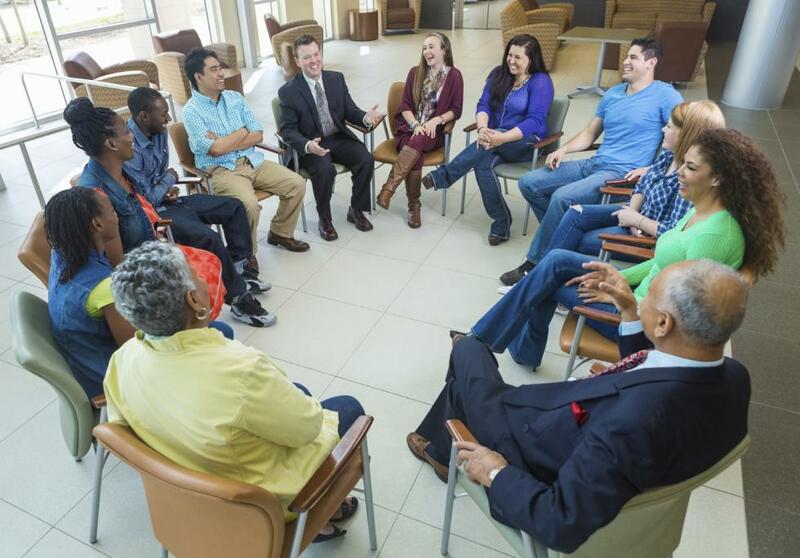 The purpose of a university-district partnership for the preparation and development of principals is to provide all schools leadership that results in improved student learning. 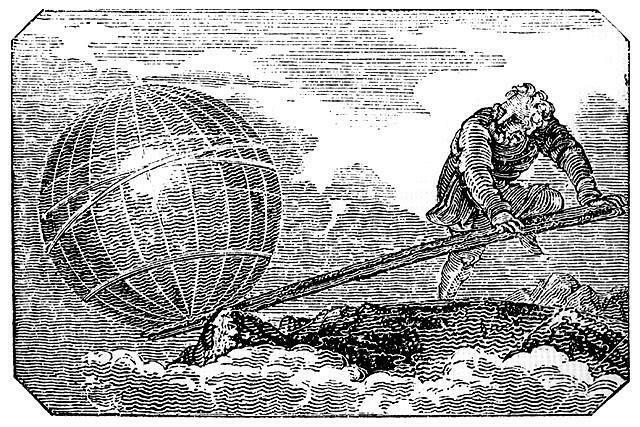 In order to be successful, both parties in the partnership will have to relinquish control over areas which have traditionally been the sole responsibility of one of the parties. Teams of participants attending this training will be guided through the decision-making process needed to plan and implement an effective internship program for principal candidates. 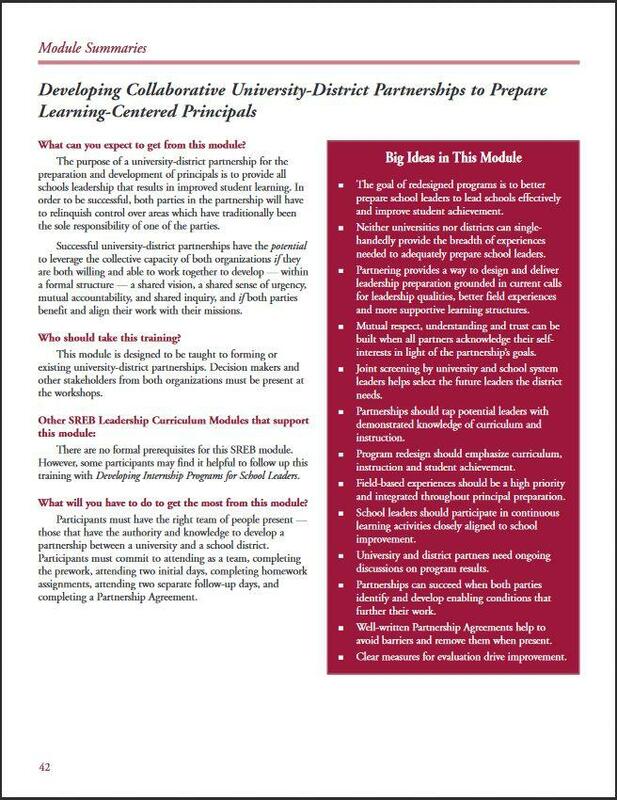 From research and current literature, they learn recommended practices for building the types of field-based experiences that help develop school leaders that make a difference in student achievement. This training is based on the idea that professional development should include authentic, real-world application. 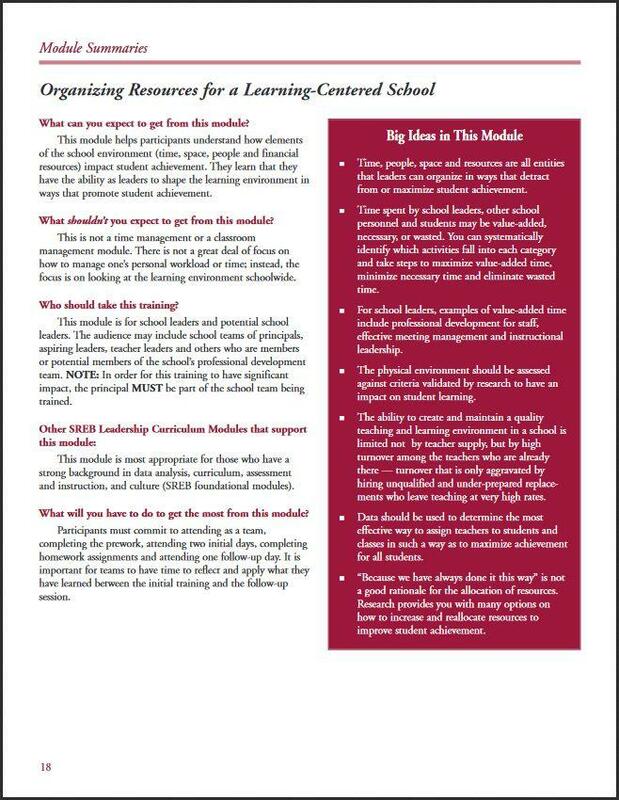 This module helps participants and school teams engage in deep reflection about extra help, advisement, engaging instruction, and student and family relationships, all with the goal of improving the participants’ ability to work in ways that motivate students and make learning meaningful for them. Participants examine the research, apply it via self-assessment, examine case examples of various practices and create plans for improvement. 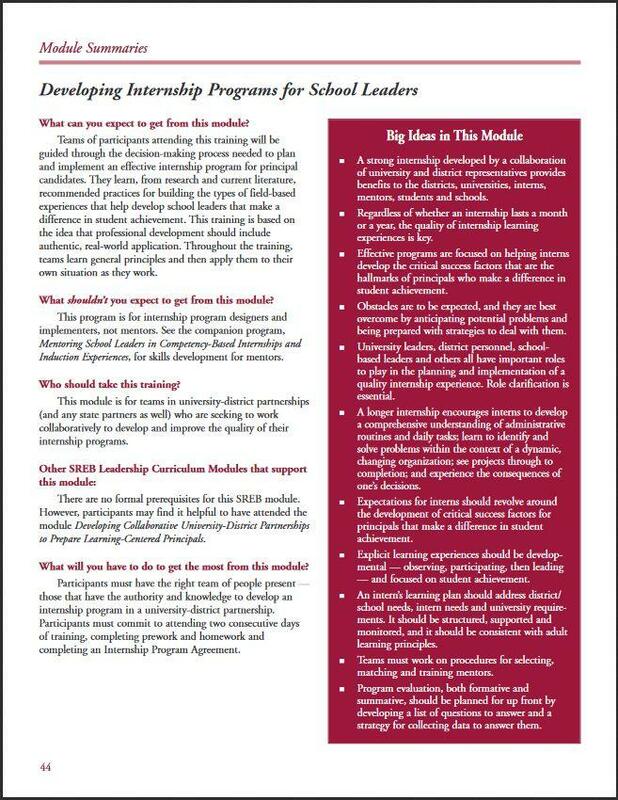 This module helps participants gain a deeper understanding of the state and/or national standards they use and then apply that knowledge to classroom practice. 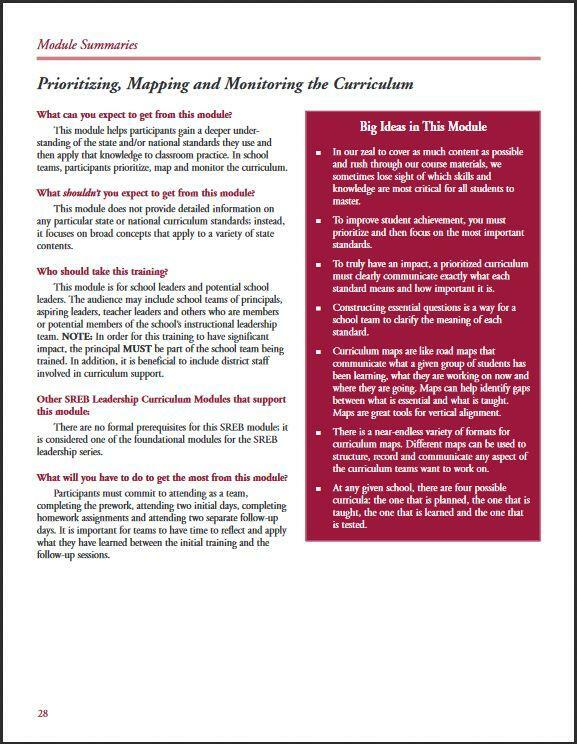 In school teams, participants prioritize, map and monitor the curriculum. This module helps participants understand how elements of the school environment (time, space, people and financial resources) impact student achievement. They learn that they have the ability as leaders to shape the learning environment in ways that promote student achievement. Are We Investing Enough to Get the School Leaders We Need? 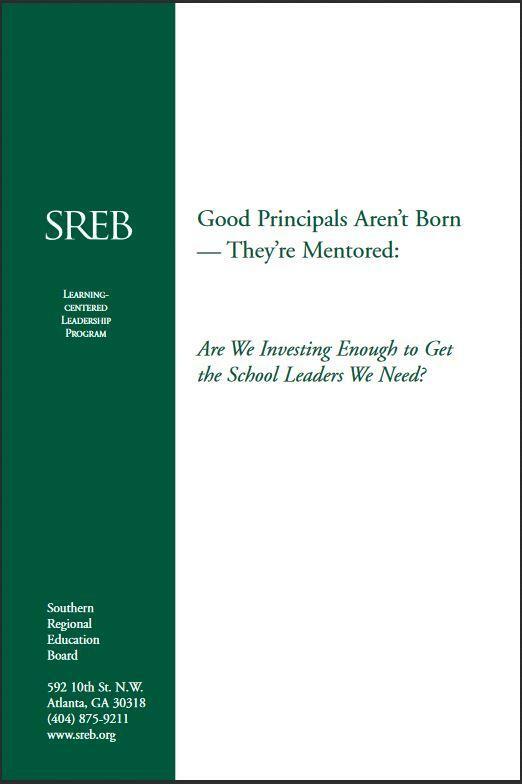 Good Principals Aren’t Born – They’re Mentored draws on survey data from a sample of seasoned principal mentors who have guided interns in university-based principal preparation programs in the SREB region. This report lays out a course of action for policymakers and leaders of universities and school districts to ensure that every beginning principal comes to the job fully prepared to make a difference in teaching and learning.